When Philip Wiese looked up information earlier this year about the job opening for director of New Albany Deanery Catholic Youth Ministries (NADCYM), he happened across a photo of Father Douglas Marcotte, pastor of St. Augustine and Most Sacred Heart of Jesus parishes, both in Jeffersonville, in the southern Indiana deanery. 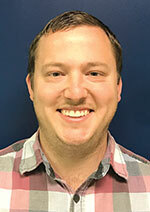 At the time Wiese, 29, had worked for three years as director of youth ministry at a parish in Gulf Shores, Ala., not far from his family and where he was raised. His wife worked as music director for the parish. The couple had recently prayed, “asking the Lord to lead us if we’re supposed to go somewhere else,” he says. But Wiese still wasn’t sure he was meant to leave his job and extended family. Then he attended a reception in Mobile, Ala., for a friend who had just been ordained a priest. At that reception near the Gulf of Mexico was a priest from southern Indiana—Father Marcotte. “I told him my story. I told him my vision and background. Everything became a clear focus” after that encounter, says Wiese. He started his new job as director of NADCYM on July 31. Its offices are located on the grounds of Mount St. Francis Center for Spirituality in Mt. St. Francis. Wiese graduated from Franciscan University of Steubenville in Ohio—“where I met my beautiful wife,” he adds—first with a degree in theology and catechetics, with a focus on youth ministry, then with a master’s degree in theology and Christian ministry. With his degrees, involvement in youth ministry since he was a teenager, and experience as director of youth ministry at a parish, Wiese says his new job is a perfect fit. “I think what this job needs in terms of leadership and going forth, it’s just wild how I have the skills to achieve it,” he says. Being director of NADCYM does not mean Wiese is director of youth ministry for the 18 parishes of the New Albany Deanery. Rather, Wiese says, he is a “servant” to the deanery’s parishes. “I’m not an authoritative boss,” he explains. “We help build up ministry in all of these parishes at the ground level, whether they have a volunteer or hired [youth] minister. We offer any resource we can provide, events, retreats, mission trips. New Albany Deanery Catholic Youth Ministry reaches beyond youths. They offer ministries to those in middle school, high school and college, as well as offer young adult, Hispanic and family ministries, and athletics. The events, retreats, mission trips and other activities NADCYM offers have one long-term goal, says Wiese: to develop missionary disciples. In regard to his visions for NADCYM, Wiese says there is a “beauty to being an outsider—I can be purely objective in looking at things. Having just moved to southern Indiana from Alabama, Wiese and his wife are still searching for a parish home for their family, which includes children ages 5, 4, 3 and 2, with another child due in March. He says they feel “blessed” to be in the archdiocese and in New Albany Deanery. “The Lord led us here,” says Wiese. “Everything points to that.